I stumbled across these Future Fins because I had no other choice, and now I love them. I bought my first quad at Surf n Sea a while back and was looking for a set of fins for it that same day. The shop was completely out of quad fin sets but they did have a pair of 340 Quad Rear fins by Future Fins. My friend owed me some money so he decided to give me an extra pair of outer fins that he had, and I bought the 340 Quad Rear fins. It definitely took me some time to figure out how to surf the new set up and get used to these Future Fins. The 340 Quad Rear fins are much smaller than the averaged sized fin, a little over 3 inches tall with a just over 3 inch base compared to the normal fin size of just over 4 inches tall with a just over 4 inch base. On the Future Fins website they are described as being made for either “the lighter grom or for a looser ride”. Being much smaller, the fins do not dig deep into the wave like normal sized fins making it much easier for me to get the fins free on turns. I still feel like I have a lot of stability to be able to pump really fast down the line, but then I also get a lot more freedom in the tail when making hard turns. At first it was kind of hard for me to get used to the change, but once I figured it out it opened up new possibilities on waves for me. To really enjoy these small-sized Future Fins you have to use them in the right conditions. On the North Shore I used my quad in some waves that were obviously too big and powerful for the board and the little 340 Quad Rear fins that were on it. Once the big swells died and I got some smaller and mellower waves, I was able to really enjoy using these fins. In California the past couple weeks I have been using a pair of 340 Quad Rear fins on my board down here and loving it. The waves here are much more suited for surfing with these fins allowing me to try all kinds of new things. 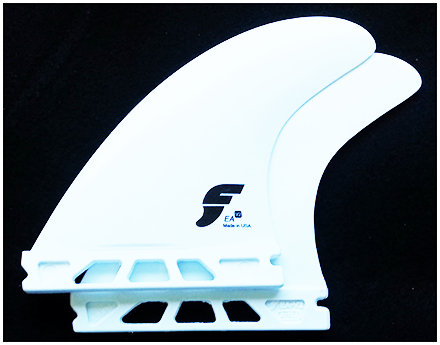 The 340 Quad Rear fins by Future Fins cost $29.99, and can be found at most surf shops.